The first icon in our series is Alexandra Queen of Denmark, who Queen Victoria’s son, Edward, Prince of Wales married in 1863. For years before her coronation, however, the future Queen’s radical style was revered as a fashion icon and her new jewels and outfit choices automatically set trends. 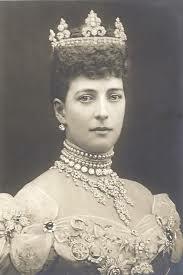 In fact, Queen Alexandra was responsible for starting two of the most important jewellery trends of the late 19th/early 20th century: high-necked, dog-collar-like pearl chokers and diamond tiaras. Born Princess Alexandra Caroline Marie Charlotte Louise Julia or simply ‘Alix’ to her friends and family was raised in an 18th-century townhouse in Copenhagen. Although Alexandra was of royal blood, she had a relatively normal and humble upbringing. Alexandra spent most of her childhood surrounded by family, predominantly her younger sister Dagmar with whom she shared a bedroom. The sisters lived off their father’s army salary and although they both had an early taste for fashion, they spent their free time sewing simple and understated dresses for themselves. Queen Victoria and Prince Albert wanted to ensure they found a suitable candidate to marry their son, Albert Edward, the Prince of Wales. The candidate was required to be clever enough and sensible enough to tame ‘Bertie’ as he was known, who had built a reputation in his adolescent years as being frivolous and overindulgent. After the death of her husband, Queen Victoria reached out to her daughter to help them find a fitting suitor. Initially, Queen Victoria was eager to find a German husband for her daughter as most of the British Royal Family’s relations were German, however, none of the propositions was adequate. Eventually after hearing accounts of Alexandra’s charming and amiable qualities and seeing photos, which reaffirmed her choice they left people mesmerised by her beauty the Queen settled on her as “the only one to be chosen”. The pearl and diamond, high-necked choker necklace is one of the most iconic jewels from the Belle Époque era. The necklace has a tight fitting around the neck and is often adorned with various floral designs, buckles and other elaborate motifs. These dog-collar-like necklaces may never have reached such high levels of popularity, however, had it not been for a small scar on Alexandra’s neck that she had had since childhood. Alexandra, who was known to be extremely image-conscious, went to great lengths to try and conceal this scar, especially when seen in public. 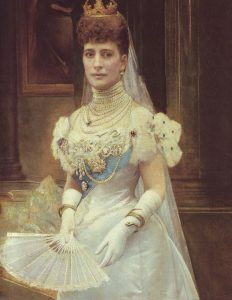 As a consequence, Alexandra was rarely seen with a bare neck and instead covered herself in multiple layers of diamonds and pearls short necklaces. Alexandra’s influence was so strong that all leading fashion houses began producing variations of the choker necklace and soon enough every proper woman of fine society was seen wearing one. 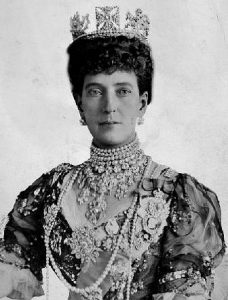 It is quite possible that the small, childhood scar on Queen Alexandra’s neck started a trend in jewellery that proper woman of fine society followed for 50 years. Elaborate diamond tiara was another favourite of Alexandra’s. After her coronation, she was often seen wearing the most elaborate diamond tiara’s to reflect her status in society. 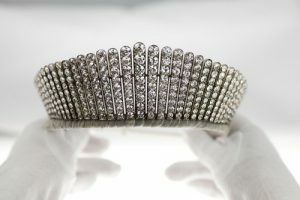 This provided huge momentum to another trend and the tiara soon became a staple piece for royalty and wealthy industrialists to copy.